Puppyhood is the most important time in your dog's life. She's learning more about herself, people, other dogs and the world outside than she ever will again. Your puppy will never again be so open to outside influence. Early intervention can nip many behavior problems in the bud and make the difference between a problem dog and a beloved companion. Our puppy program is far more than a miniature version of an adult obedience class; it's your chance to help your puppy grow into the dog you'll want to live with. Get started today! 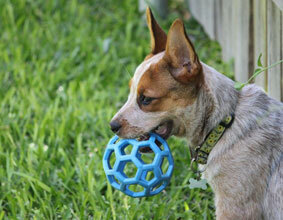 Email info@kimthedogtrainer.com, call (512) 796-5783 for more information or register for puppy class online.. Schedule: Every Sunday morning from 9 to 10 at South Park Animal Hospital, 615 W. Slaughter Ln. Suite #121. Give your puppy the best possible start in life! Early socialization will help you to grow your puppy into a dog who'll be a pleasure to live with. raise a puppy you'll have for a lifetime. For your puppy's safety, classes take place in a properly sanitized veterinary office. Puppies must have received their first round of vaccinations before class but are not required to have completed the entire booster series. The ideal age for puppies to begin class is 7-10 weeks. Read the ASVAB's position paper on the importance of early socialization for more information. $125 per session or $400 for four lessons. Feeling overwhelmed? We understand. As a new puppy owner, you have so many decisions to make and so much to learn. What do we do when puppy bites us? What should we feed her? Should we crate train? Your friends, neighbors and even strangers on the street will give you lots advice, but how do you know if it's good advice? We can help you raise your puppy in ways that work for you and make you feel comfortable. During our visit we'll assess your puppy, discuss your goals and give you professional advice that's right for your puppy - advice that really works and that you can really follow. crate training - yes or no? the best way to handle the "puppy crazies" and other wild behavior. Give your puppy the best possible start in life with our board and train program. We take your puppy into our own home for four weeks of intensive socialization. learning and character building. We understand that raising a puppy is not as easy as living with a fully trained adult dog! If you're feeling overwhelmed by the time commitment, patience, energy and close supervision puppies require, we can help. Four weeks is a long time for puppies to be away from their families! We encourage our students to visit their puppies frequently and take them home for brief periods to ensure proper bonding.